Since we moved into our new home in December, I have been trying to lure all the tiny winter birds out of hiding so that they could bring a little woodland cheer to me each day. So far I have had no luck. No wonder, really. Last time I looked my suet block had a crust of snow edging the top, and a foot long icicle dangling below. While I pride myself on being the hostess with the mostess, it seems in this instance I have encountered an epic fail. 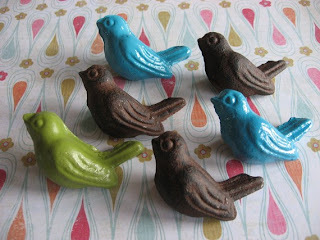 So, I am going to cheer myself here with some wonderful little flighted fellows that I have discovered on etsy. 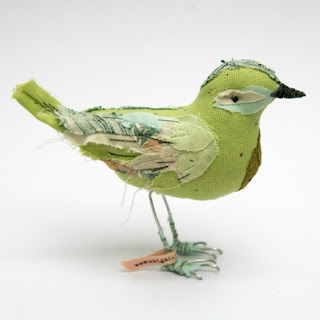 This fabric bird sculpture has the exact correct amount of whimsy. I love the layering on the wings, and the dainty wire feet. Find this and others in the shop of abigailbrown. I have fallen head over heels with these cast iron drawer pulls. I will be on the lookout for the perfect antique cabinet to make over with these lovelies. They can be found at careyleigh007. I know that I will not lure any hummingbirds here at the moment, but I hope to encourage them to visit come summer. 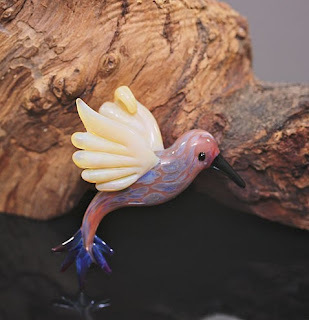 In the meantime, I found this lampwork hummy in the shop of GlassRoger. Here's a bird that we certainly do not have a shortage of here. 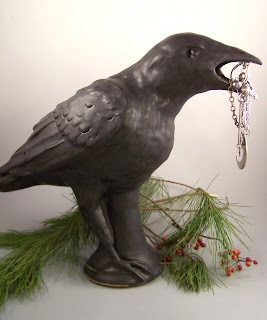 This cunning raven has a beak full of treasure. Created by twooden. Well, I must fly. *snicker*. Have a lovely day. The result its really positive i might say. You can have all the advantages on creating something good if you have the skills.